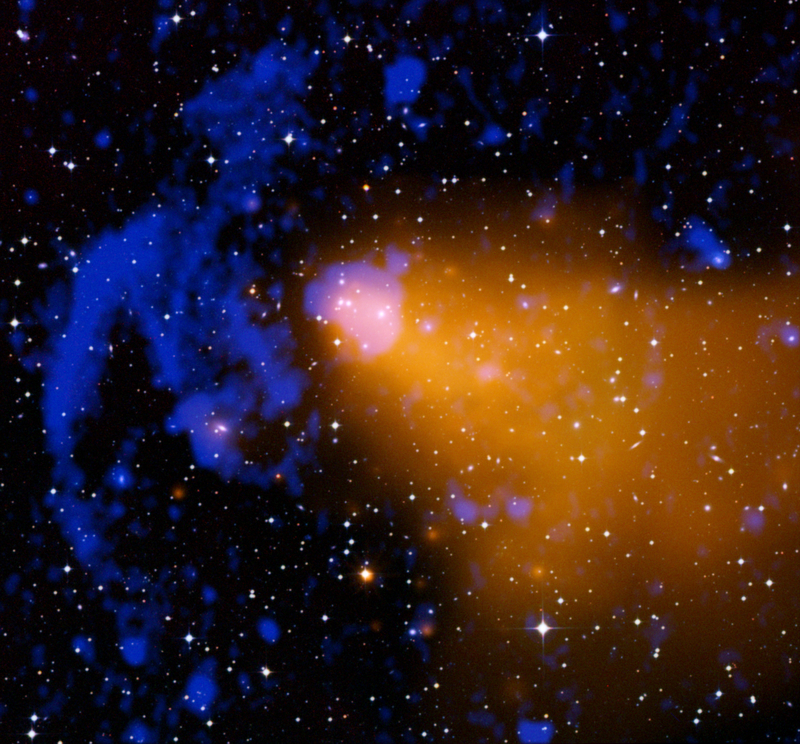 Two different teams have reported using Chandra observations of galaxy clusters to study the properties of gravity on cosmic scales and test Einstein's theory of General Relativity. Such studies are crucial for understanding the evolution of the universe, both in the past and the future, and for probing the nature of dark energy, one of the biggest mysteries in science. This composite image of the galaxy cluster Abell 3376 shows X-ray data from the Chandra X-ray Observatory and the ROSAT telescope in gold, an optical image from the Digitized Sky Survey in red, green and blue, and a radio image from the VLA in blue. The "bullet-like" appearance of the X-ray data is caused by a merger, as material flows into the galaxy cluster from the right side. The giant radio arcs on the left side of the image may be caused by shock waves generated by this merger. The growth of galaxy clusters like Abell 3376 is influenced by the expansion rate of the universe - controlled by the competing effects of dark matter and dark energy - and by the properties of gravity over large scales. By contrast, observations of supernovas or the large-scale distribution of galaxies, which measure cosmic distances, depend only on the expansion rate of the universe and are not sensitive to the properties of gravity. In the first of the new studies of gravity, an alternative theory to General Relativity called "f(R) gravity" was tested. In this theory, the acceleration of the expansion of the universe does not come from an exotic form of energy but from a modification of the gravitational force. Mass estimates of galaxy clusters in the local universe were compared with model predictions for f(R) gravity. Data from geometrical studies, such as supernova work, were also used. Using this comparison between theory and observation, no evidence was found that gravity is different from General Relativity on scales larger than 130 million light years. This limit corresponds to a hundred-fold improvement on the bounds of the modified gravitational force's range that can be set without using the cluster data. In the second study, a comparison was made between X-ray observations of how rapidly galaxy clusters have grown over cosmic time to the predictions of General Relativity. Once again, data from geometrical studies such as distances to supernovas and galaxy clusters were incorporated. Nearly complete agreement was seen between observation and theory, arguing against any alternative gravity models with a different rate of growth. In particular "DGP gravity" (named after its inventors Gia Dvali, Gregory Gabadadze, and Massimo Porrati) predicts a slower rate of cluster growth than General Relativity, because gravity is weakened on large scales as it leaks into an extra dimension. Like f(R) gravity, the DGP model is designed to avoid the need for an exotic form of energy causing cosmic acceleration. Chandra observations of galaxy clusters have previously been used to show that dark energy has stifled the growth of these massive structures over the last 5 billion years and to provide independent evidence for the existence of dark energy by offering a different way to measure cosmic distances. Scale Image is 29 arcmin across (about 5 million light years across). Coordinates (J2000) RA 06h 02m 10.00s | Dec -39° 57´ 20.99"
Great information. I got lucky and found your site from a random Google search. Fortunately for me, this topic just happens to be something that I've been trying to find more info on for research purposes. Keep up the great work and thanks a lot. chandra.harvard.edu did it again. Incredible writing. The redshifts of the galaxies in the cluster are used, along with a model for the expansion of the universe as dominated by dark energy and dark matter. The details are complicated, but in general the larger the redshift the larger the distance. This work is testing the *possibility* that the acceleration in the expansion of the universe is because of the modification of gravity. The crucial point is that so far no evidence has been found requiring changes to General Relativity. not sensitive to the properties of gravity when acting over very large scales. For example, in a model of the universe people can change the way gravity acts over large scales so that it differs from the predictions of General Relativity. This reproduces accelerated expansion without the need for dark energy, but this changes the way galaxy clusters grow. So far such deviations from General Relativity have not been seen. This is an interesting idea, but even if some mechanism was able to generate magnetic fields over very large scales, it wouldn't be able to have a significant affect since matter on these scales will be electrically neutral. On these scales gravity dominates over magnetic forces. Would it be possible to have more information about Chandra? Like a portable transmitter like those who are doing that. Also more info on aerospace assistive medical technologies. I wonder if anyone ever thought that maybe this Dark Matter Dark Energy is nothing more than all the magnetic forces in the universe pushing and pulling everything around and being such a large magnetic force would be very difficult to detect since it would be on such an epic scale there is not a technology out yet to prove against this theory. Interesting article. But your comment about the expansion rate being not sensitive to the properties of gravity is somewhat puzzling. After all, the expansion rate is none other than the Hubble parameter, which is expressed in terms of the energy density rho divided by the square of the gravitational constant G, in addition to lambda and the curvature parameter k. So how could it be said to be insensitive to the properties of gravity? As you mentioned that expansion of the universe is not because of exotic energy but from the modification of gravity force. Is it not so that gravity force is also Energy it is all over in the universe? If I am wrong please forgive me for the mistake. How can one tell the difference between 100 million light years away and 10 or 600 million light years away. I am constantly befuddled by the distances away and across in light years. I would love a poster of the latest Abell 3376, if it become available. A cluster of galaxies about 614 million light years from Earth. About 614 million light years from Earth. 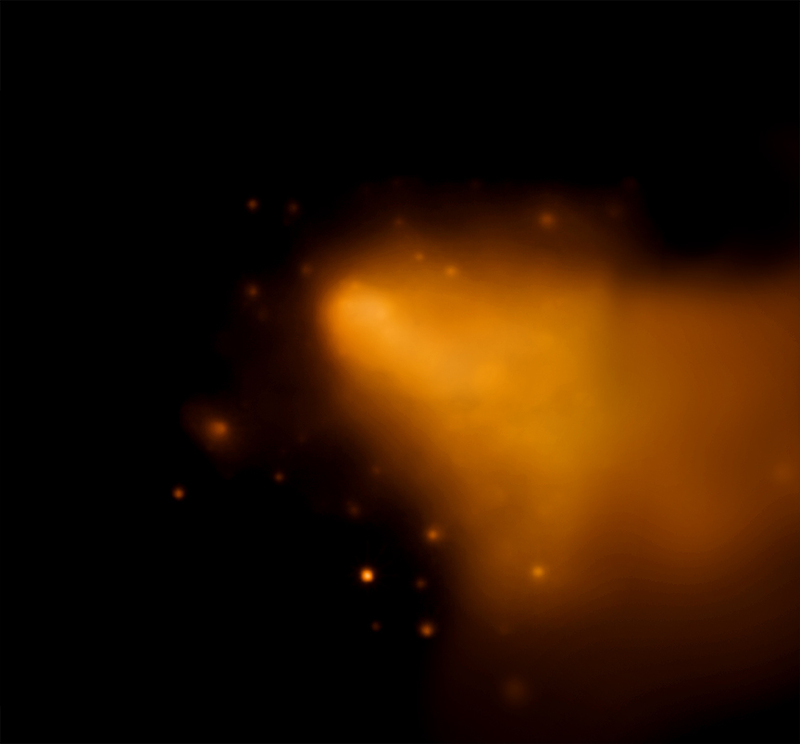 X-rays from Chandra and ROSAT were overlaid on optical data from DSS and radio data from the Very Large Array. About 5 million light years across. X-rays are gold, the optical data are red, green & blue, and the radio data are dark blue. In the constellation Columba ("dove") visible in the Southern Hemisphere.